The MICs Group of Health Services is an organization who looks over the hospitals in Matheson, Iroqouis Falls and Cochrane. And this year, you can help them improve the quality of care they can provide. Originally established in 1919, the name of the hospital was the “Rosedale War Memorial Hospital” in honour of the men of the church who died in WWI. The hospital housed patients as early as April 1922, but did not formally open until June. In 1954 a new hospital of 29 beds was constructed on the present site, through the very generous support of all the citizens, firms, and service clubs in the area. Today Bingham Memorial Hospital is an acute general hospital which provides a wide range of in-patient, long term, chronic care, emergency, out-patient, and ambulatory care services. Anson General Hospital was founded in 1955 as a state of the art health care facility that could meet most major medical needs. Since then, the hospital has sought to employ the latest technologies in their bid to provide top-line service. Lady Minto Hospital in Cochrane was founded in 1911 to serve the needs of local patients with the highest levels of medical care possible. Though the hospital has occupied more than one facility over the past century, it’s mission remains unchanged, bringing state of the art medical solutions to those in need. In order to keep up and remain state of the art, these hospitals and MICs Group of Health Services need help. The Moose FM Community Cares Radiothon is dedicated to doing just that. 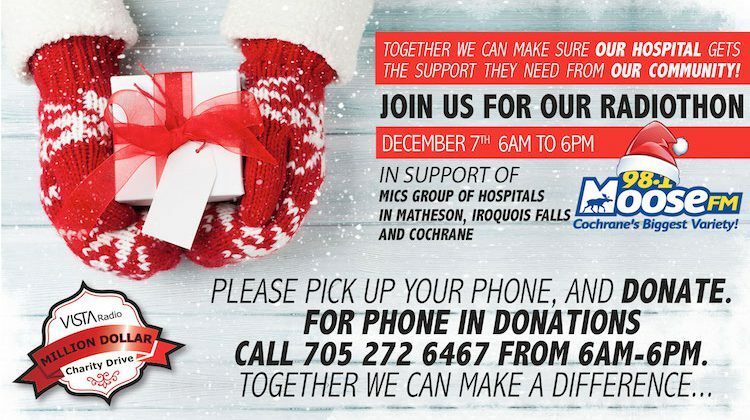 On Friday December 7th from 6am to 6pm you can call 705-272-6467 or stop by the Moose Studios at 22 B 5th Street in Cochrane to make a donation. All money raised will go towards buying a new Digital Radiography Mobile Unit. This is a portable high-resolution x-ray scanner that provides instant images to doctors both local and remote, while the patient rests comfortably in their room. The machine will be especially helpful in diagnosing those who cannot be easily transported to a traditional x-ray. Together, we can keep the MICs Group of Health Services Hospitals up to date and state of the art.